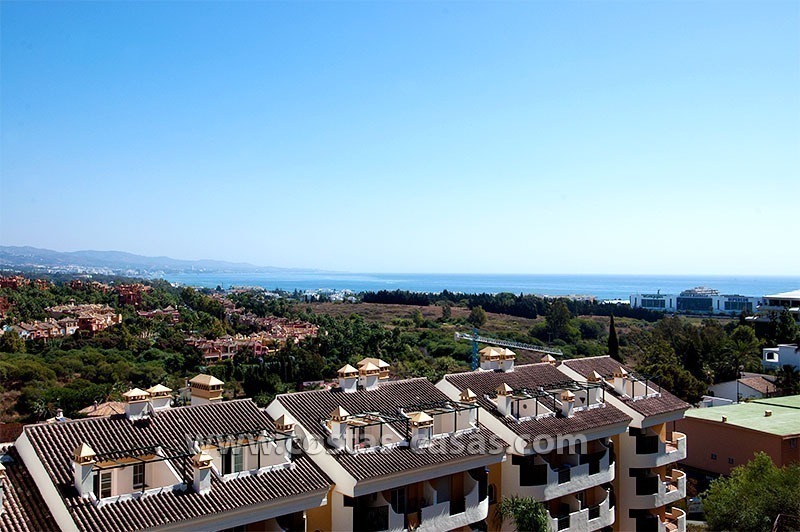 Bargain luxury golf apartment for sale, golf resort, in the area of Marbella – Benahavis – Estepona Original priced at 605.000 € Corner apartment. Panoramic golf, lake and sea view. South facing Located within a gated and secure 5* golf resort with a 5* hotel facilities Resale, just on the market. Urgent viewing highly recommended. Apartment for Sale in Nueva Andalucía – Marbella This apartment is part of a residential development featuring 24-hr security, lush gardens and three swimming-pools of which one will be covered and heated in the near future. The complex is located a mere stone’s throw away from a commercial centre and all its associated amenities. It is also within a short walking distance of Puerto Banús. The property offers spectacular views of the valley, mountains and sea from spacious covered and open terraces. Luxury Apartment for sale in Nueva Andalucía – Puerto Banús – Marbella The property is part of an enclosed complex of apartments, townhouses and villas with 24-hr security, concierge service, paddle tennis court, manicured tropical gardens, two swimming-pools and other indoor facilities exclusive top the owners. The complex is located within easy walking distance of the famed Puerto Banús. In the immediate vicinity an abundant number of amenities may be found such as exquisite boutiques, sprawling malls, trendy restaurants, hip beach hangouts. 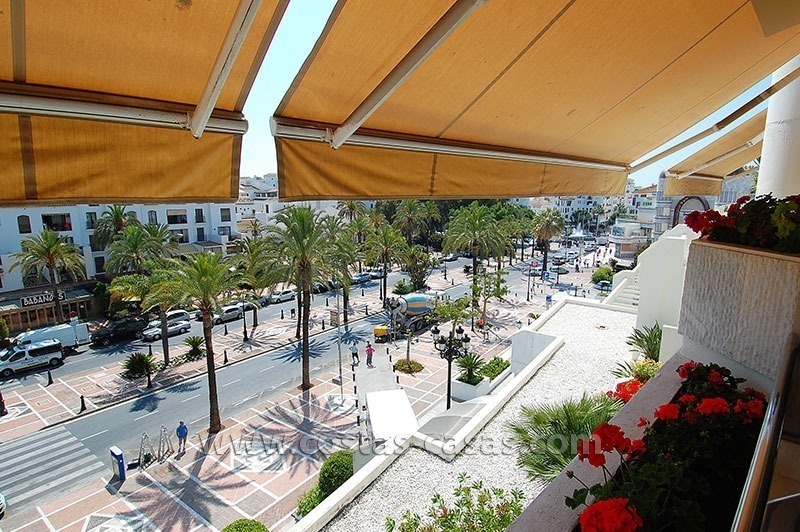 Beachfront hotel apartment for sale in Puerto Banús – Marbella Front line 5 star apartment hotel complex located at short walking distance to the habour and centre of Puerto Banús offering a prime position and on a door’s step to amenities, shops and many restaurants. 5 star hotel facilities and excellent rental possibilities Stunning views over the sea and the promenade. Living and dinning room leading to the ample terrace. Update: price reduced! Townhouse for Sale in Nueva Andalucía - Marbella Residential complex of townhouses situated on a slight elevation with a gated entrance, concierge services, heated swimming pool and in-house restaurant and cafeteria. From the two verandas – one on the ground floor and one on the upper floor - and the roof terrace good views may be enjoyed of the mountains, golf courses and the surrounding valley. 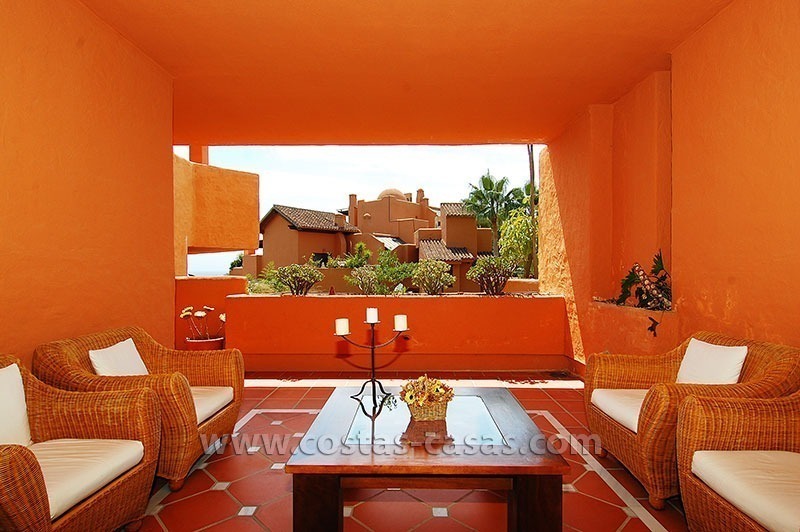 The property faces south to southwest and offers partial sea views as well. Resales available. Located right at the beach and within easy driving distance of renowned golf courses, these brand-new apartments offer buyers a unique opportunity to acquire the exciting Marbella-lifestyle at a deep discount. 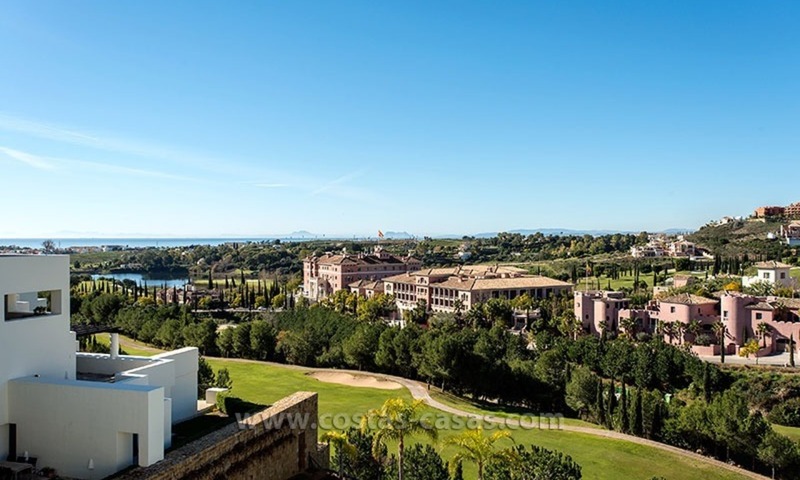 For Sale: Contemporary Luxury First-line Golf Apartment in the Marbella – Benahavís – Estepona Triangle This property forms part of an exclusive, fenced first-line golf estate erected in contemporary style on the grounds of a 5-star golf resort. The estate features round-the-clock security, lush gardens and a swimming pool. From its spacious terraces, the southwest facing apartment offers unobstructed views of the fairways, the mountains and the Mediterranean Sea all the way up to the coast of Africa. 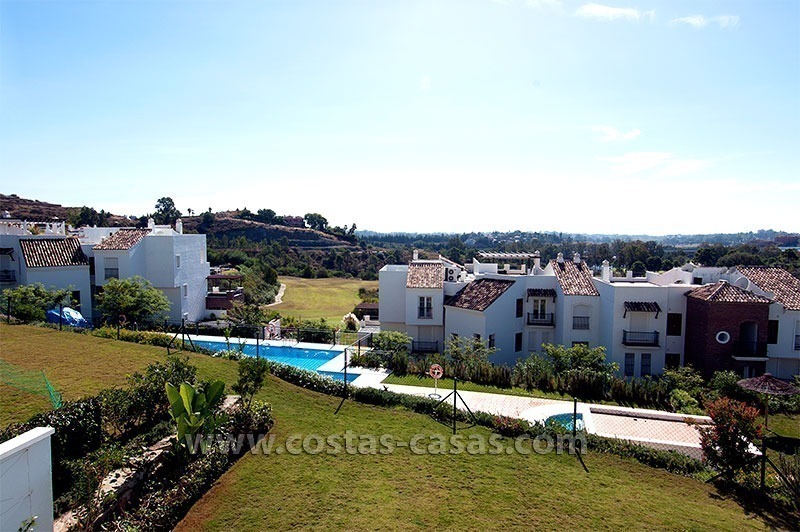 For Sale in the Marbella – Benahavís Area: First-Line Golf Apartment This fine property is part of a small, peaceful and recently finished estate surrounded by ample greenery and featuring a swimming pool. Just a short drive distant from shops and within ten minutes of trendy Puerto Banús and its many commercial venues and eateries, this apartment is south facing and enjoys good views of the gardens and adjacent golf course, the mountains and the Mediterranean.